The evidence shows that preparing wholesome meals at home can have a significant impact on both family health and household budgets, and experts from the Rutgers Cooperative Extension have summed up the basics in two articles packed with tips and facts. The articles are available on the Union County website, ucnj.org/rce… The Rutgers Cooperative Extension of Union County is supported in part by the Freeholder Board. It belongs to the U.S. Department of Agriculture’s nationwide Extension program, aimed at providing the public with scientific research about community health and economics. Extension offices throughout the country are encouraging families to join the “Dine In” campaign on Dec. 3, as part of an annual celebration of the family and consumer sciences profession… People tend to eat healthier meals when they eat at home because they can better control portion sizes and the use of sauces, dressings, and other high-fat ingredients. Those unseasonable temperatures that lingered across New Jersey last month, making it comfortable to be outdoors, tied a record in Newark and matched the fifth warmest November statewide in 120 years… That’s the word from the National Weather Service and state climatologist David Robinson at Rutgers University, after they analyzed temperature readings for all 30 days of November… “It’s a lock the first two weeks of this month are going to be above average, and it will be very difficult to find a lot of wintry weather before the first of the year,” Robinson said… As for this week, the light rain that’s falling across New Jersey is expected to continue on and off through Wednesday night, with temperatures hovering in the mid- to upper 50s, slightly above normal for this time of year. How Did the 2015 Hurricane Season Compare to Predictions? 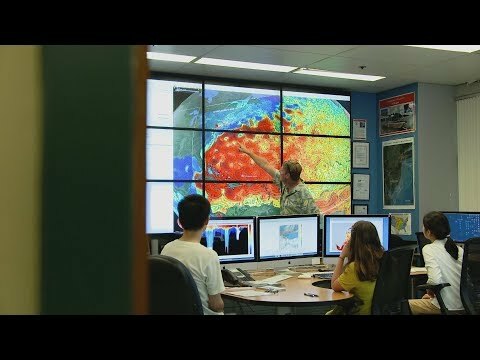 Prior to the start of the 2015 hurricane season, meteorologists and weather researchers predicted the strong El Nino conditions out in the Pacific would likely reduce the number of hurricanes and tropical storms developing in the Atlantic this year… Eleven named storms formed in the Atlantic Ocean this year – one less than average. Just four of those storms strengthened into hurricanes, below the typical average of six to seven. And no hurricanes ended up making landfall along the eastern seaboard, which was great news for New Jersey… “It was a very quiet season this year,” said David Robinson, the state climatologist at Rutgers University… Even though ocean temperatures in the Atlantic were warmer than average, and hurricanes tend to thrive in warmer water, the storms that formed in 2015 “tended to be on the weaker side and short-lived,” Robinson said. Just Why Was Sunday’s Sunset So Spectacular in N.J.? Drenching downpours in early October and scattered showers during the past week were not enough to ease the drought worries that have plagued New Jersey this year… “We’ve been in a somewhat static situation” during the past few weeks, said David Robinson, the state climatologist at Rutgers University. The heaviest rain that fell the past two days – about 1 to 2 inches – was concentrated along the Shore and southern New Jersey, so it helped Monmouth County but did little to help the counties further north… Robinson said the agencies monitoring New Jersey’s groundwater and reservoir levels are in a wait-and-see mode right now, essentially waiting to see what Mother Nature will bring the rest of this month and in December. Two 4-H members will represent New Jersey at the National 4-H Avian Bowl Contest to be held at the National 4-H Poultry and Egg Conference scheduled for Nov. 18-19, in Louisville, Kentucky. Approximately 250 individuals will be attending this national conference… The 4-H Avian Bowl is a double elimination contest for teams patterned after other knowledge bowls. Teams consist of 2-4 members per team. Avian Bowl is an educational project, in which 4-H contestants must have a comprehensive knowledge of subject matter for several species of poultry, food safety, physiology, nutrition, eggs and other related subjects. The National 4-H Avian Bowl is sponsored by the Poultry Science Association… “This the first time in the history of the National 4-H Avian Bowl competition that New Jersey has had a team participate. Avian Bowl offers 4-H’ers an excellent opportunity to work as a team to advance their knowledge in poultry related topics. We are proud of our team and look forward to participating in future years!” says Jeannette Rea-Keywood, State 4-H Agent and New Jersey 4-H Youth Development Program – Small Animal Project Advisory Council liaison. Somerset County 4-H member James Meier has been selected to attend National 4-H Congress scheduled for Nov. 27-Dec. 1 in Atlanta… James will be part of the New Jersey delegation of 17 teen 4-H members from nine counties (Atlantic, Cumberland, Hunterdon, Middlesex, Monmouth, Morris, Ocean, Passaic and Somerset)… National 4-H Congress is the premiere national educational and recognition event for the 4-H youth development program. For over 90 years, youth from the United States and its territories have participated in this youth leadership development conference… The theme for 2015 event is “Excite, Spark, Ignite.” The conference will focus on the Cooperative Extension System’s belief that young people can be significant partners in addressing the issues that face our nation, especially those affecting youth. The educational programs were developed for National Congress by a design team of youth and adults from around the country… The 4-H Youth Development Program is part of Rutgers Cooperative Extension, a unit of the New Jersey Agricultural Experiment Station. First, a butternut squash soup with apple cider and a bacon crumble… Next, roast bobwhite quail with cornbread stuffing that’s paired with a medallion of venison, cranberry compote, and a Madeira wine sauce… “I’m about to try venison for the first time,” says Greg Farrell, diving into the second course. He takes a bite and instantly nods his head in approval. “Oh, it’s good. Yeah.”… But Farrell is in the Rutgers Neilson Dining Hall on Douglass Campus. He’s one of 60 students enrolled in the freshman course “Rutgers 250: A Taste of Culinary History.”… The course, designed by William Hallman, chair of the Rutgers Department of Human Ecology, and ecology professors Cara Cuite and Mary Nucci, is part of the lead up to Rutgers’ 250th anniversary celebration that kicks off Tuesday… The best part Hallman says, was how often his lectures contained discussions of the impact both Rutgers and New Jersey have had on food evolution – from Rutgers’ role in developing tomatoes for the Campbell’s Soup Company in the 1930s, to Vineland, New Jersey being the birthplace of Welch’s Grape Juice. The Rutgers Master Gardeners of Union County have been part of the Union County community for almost 30 years, and last month the outstanding members of this all volunteer program received some well-deserved recognition from their peers, and Joint Legislative Resolutions in their honor from the New Jersey Senate and Assembly… The joint resolution was introduced by Assemblywoman Annette Quijano and supported by Senator Raymond Lesniak and Assemblyman Jamel Holley. It reads in part: “Throughout many seasons of change and countless hours of volunteer service, the Rutgers Master Gardeners of Union County have worked tirelessly and effectively in benefit of the community and are recognized and saluted for their exemplary dedication and motivation.”… Anyone can join the Master Gardeners. The program is run by Rutgers University experts through the Rutgers Cooperative Extension of Union County, supported in part by the Freeholder board. No previous experience in horticulture — or gardening — is needed. Each volunteer receives University-level training leading to certification as a Master Gardener.